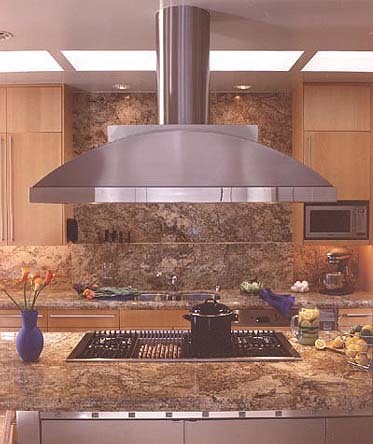 The only sleek, low profile range hood design that can stand up to the demands of the professional range. The ventilator motors have been moved from the inside of the hood to the outside of the home. Luna’s commercial baffle filter system and brawny roof mount ventilator handle the heavy work of a restaurant hood, and look good doing it. The hood is built in four individual sections – lower apron, crescent-shape canopy, crown and round exhaust flue. This allows a mix and match of finishes. (Pictured is a design altering silk brushed and mirror polished stainless.) Luna, the sort of ventilation for the serious cook.